This is a 10x10 pop-up tent which is perfect for covering small spaces or to expand covered area when used in conjunction with other tents. 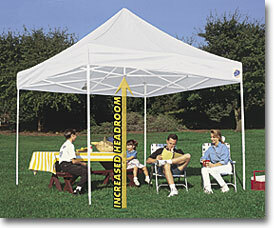 Great for covering food or drink tables at a gathering. Low cost covering for use in small areas. Installed very simply and quickly.